The period from 1688-1820 was marked throughout with riots and rebellions, seditions and strikes. Yet it began with the welcoming of Prince William of Orange, whose coronation was widely celebrated as a move towards a more democratic state. Parliament and the courts were set to become a central feature of political life. But in 1819, fifteen men, women, and children were killed and over 400 injured when the yeomanry, directed by the magistracy, attacked the mass meeting for parliamentary reform at St Peter's Field, Manchester. The long eighteenth century was characterized by the gradual erosion of consensual politics: the transfer from a cross-class consensus based on the Whig/Tory divide to divisions based instead on the notion that the state privileged the interests of certain social groups over others. This book draws together the implications of recent work on demography, labour, and law to assess their importance for defining those moments and places where class interests met and conflicted. 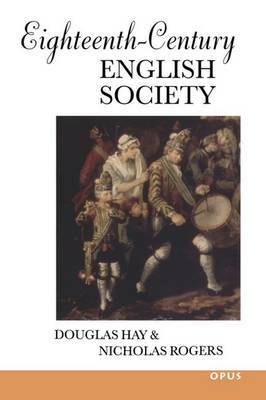 By focusing on the experiences of the eighty percent of the population who made up England's `lower orders', Douglas Hay and Nicholas Rogers accord new significance to food shortages, changes in poor relief, use of the criminal law, and the shifts in social power caused by industrialization which would bring about the birth of working-class radicalism.